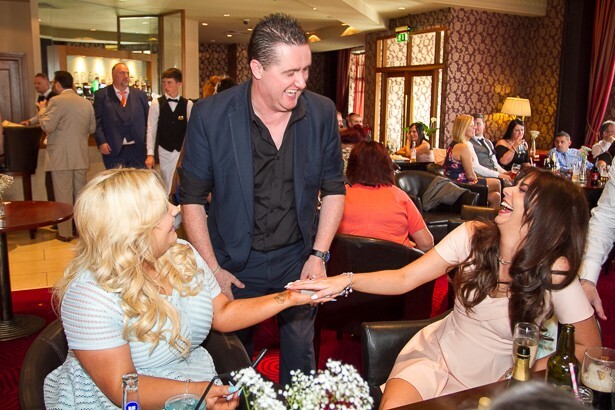 Giving the gift of magical entertainment to your guests,will give them a wonderful and unforgetable memory of your wedding day.Wedding magician Carl Campbell has performed at hundreds of weddings around Ireland. He has performed on TV and on the corporate sector for companies`such as Google, Microsoft and Bank of Ireland. Now he brings his magical talents to your wedding day. 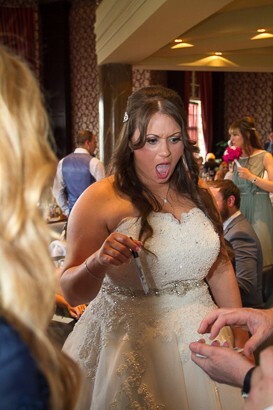 Your guests will gasp and laugh in amazement at the unbelievable magic that they witness. Your day will be pure magic and that's the best trick of all. Carl, How can we describe what you gave our guests... It was a truly special show that you performed and everyone enjoyed itthoroughly, even our parents! We would recommend you to anyone. Carl, Thanks a million for helping making our Wedding day something to remember. You had all of our guests joining in on the fun andtruly made everyone's day ssomething special. Thank You! No problem at all Carl. Thank you so much for being part of our day, all our guest had nothing but good comments about you. They were amazed and is still talking (and puzzled ????) about how you performed some of them tricks. Thanks again you really made our reception something to remember for everyone. Amazing Carl had all our guests stunned and amazed and he was so nice with all our guest. 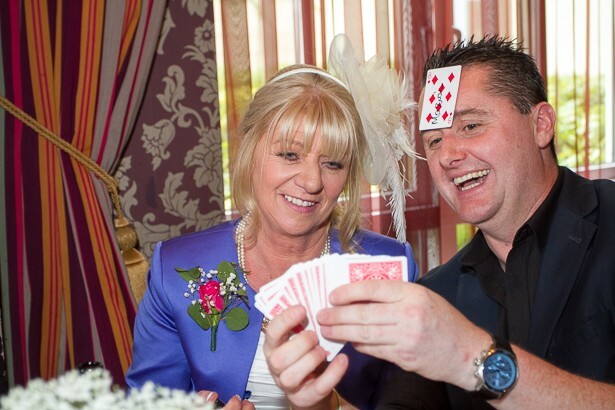 Carl performed at our wedding and done a fantastic job both adults & children were amazed. Thank you so much Carl for making our day that little bit more special ???? Carl was brilliant. All our guests had such a laugh with him. We had Carl do his thing during our reception while we were off getting our photos done. Everyone came up to us during the wedding raving about the magician. Which is always nice to here. We wouldn’t hesitate in recommending Carl. He’s excellent at what he does. Carl entertained our guests and needless to say was amazing had everybody laughing and amazed if only he could have stayed longer. Anybody undecided about maybe hiring entertainment, don't be. Carl is your man. Thanks again, Wayne and Laura. 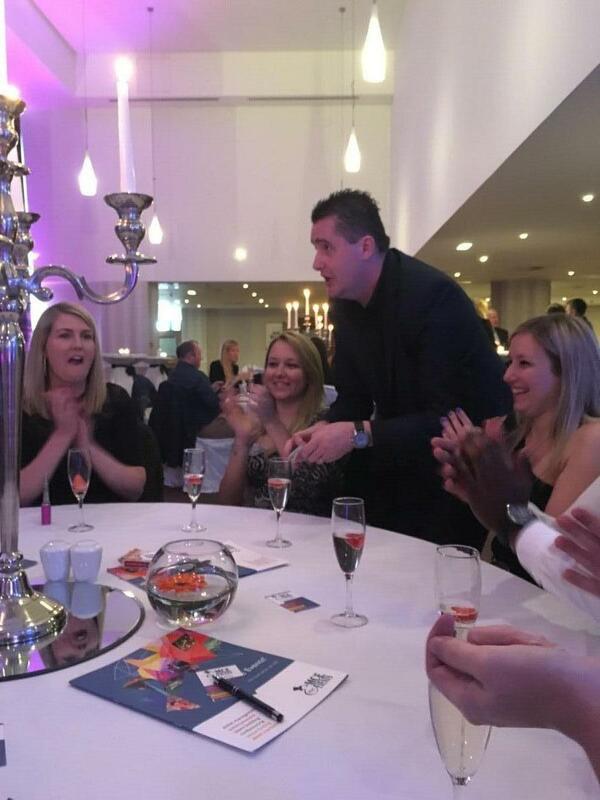 We are delighted that we chose Carl for our wedding entertainment for between the ceremony and dinner call. He was truly amazing and very professional. Carl was fantastic not only the day of the wedding but the run up we felt very at ease and reassured the day would be a success with Carl on board. Our guests were engaged the whole time during his performances. He managed to get to spend time and perform for each group. From children to adults he kept everyone entertained. Not only was his performances amazing but he has a fantastic personality. Would highly recommend Carl not only for a wedding but any event. Hi Dee. Thanks a million for having me perform at your wedding reception. 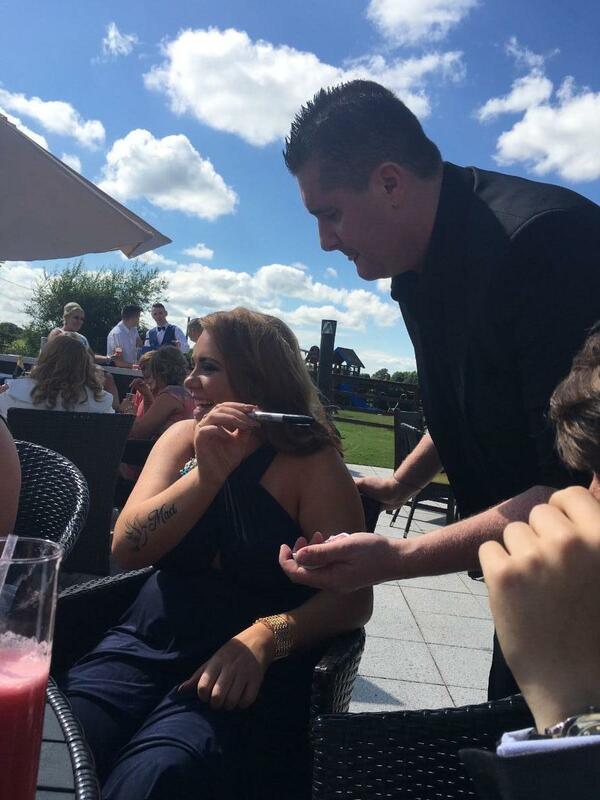 I'm delighted all your guests enjoyed my act and i was able to add a touch of magic to your magical day. All the best Carl. amazing! I hired Karl for my friends wedding. Everyone loved him. The tricks and games he played were brilliant. Would totally recommend him! Hi Ciara. Thanks a million for your lovely review and for booking me to perform at your friends wedding last week. 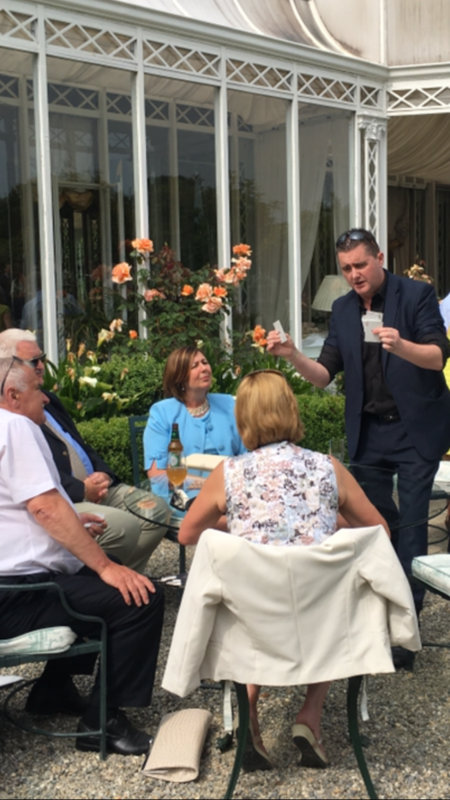 I'm delighted all the guests enjoyed my close up magic act and hopefully i get to perform for you guys sometime in the future. 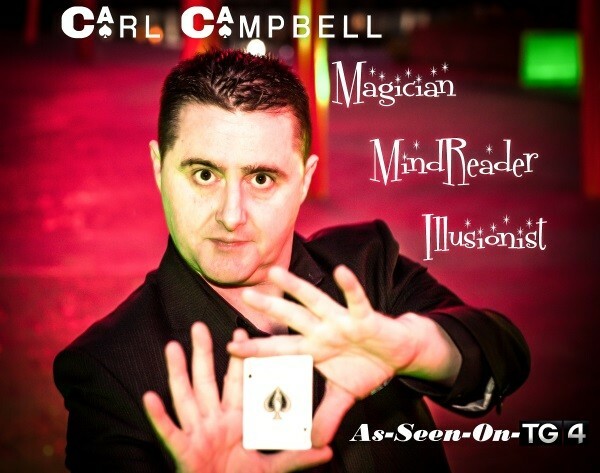 Best wishes Carl Campbell magician. Carl was excellent entertainment. 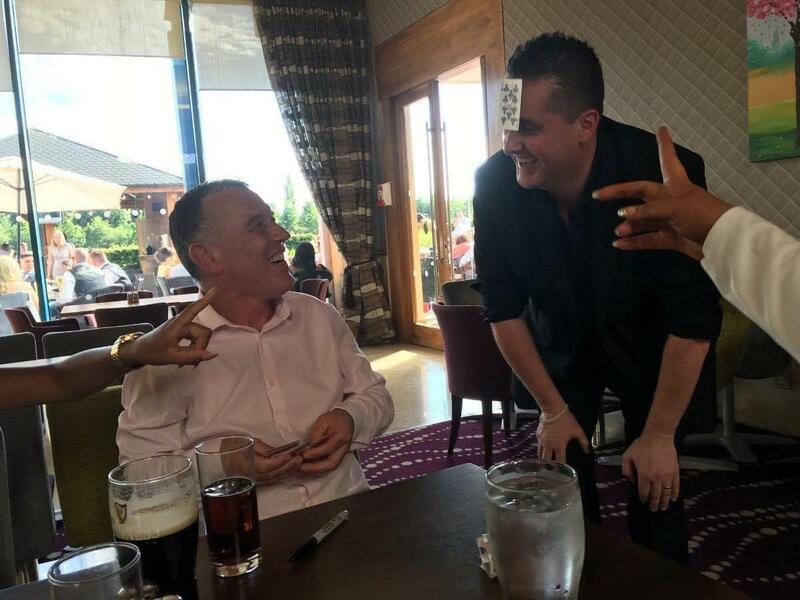 His tricks and performances were engaging and he was polite and attentive to every guest he engaged. He clearly made an effort to cover as many guests as possible. Every guest commented that his tricks were amazing. He is well able to perform to a large or a small audience and he includes props as well. His price was extremely good for the amount we got. I would recommend to anyone and I am arranging to employ him for a work function in the near future. We booked Carl after seeing him at a wedding fair and from the get go he was great to deal with. Our guests loved him and immediately came to tell us how great he was. If I was getting married again I would def have Carl as part of the day. 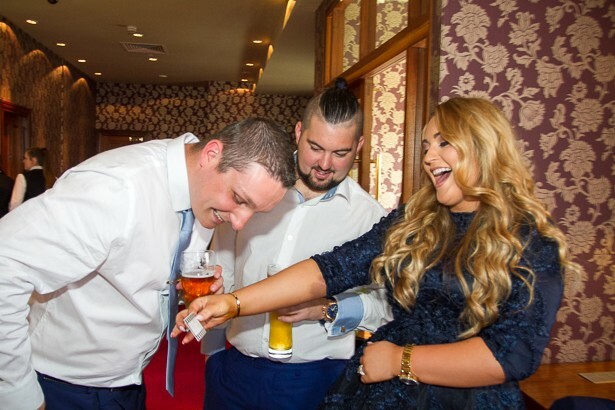 Don't waste money on a photo booth when you can have a magician like Carl! I can't thank Carl enough for his amazing performance! 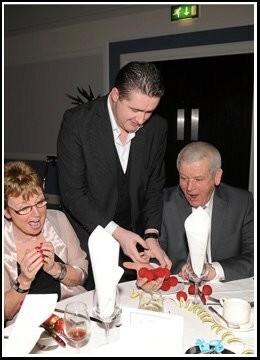 While we were off getting our photos taken he kept our guests entertained. 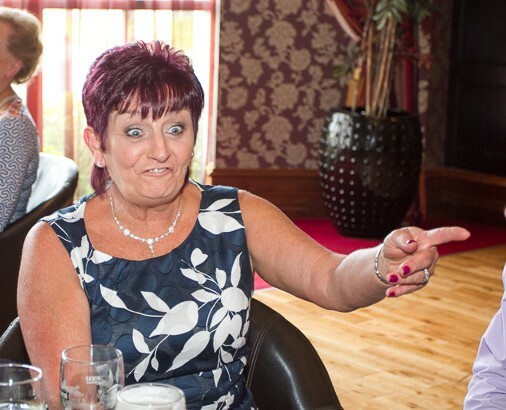 I had so many guests come up to me and tell me they had never had such a good time at a drinks reception. He even took photos of our guests being entertained and sent them to us so we got to see that part of the day. If your looking for something fun and different for your big day I recommend Carl Campbell 100%. Hey Louann and Alan. 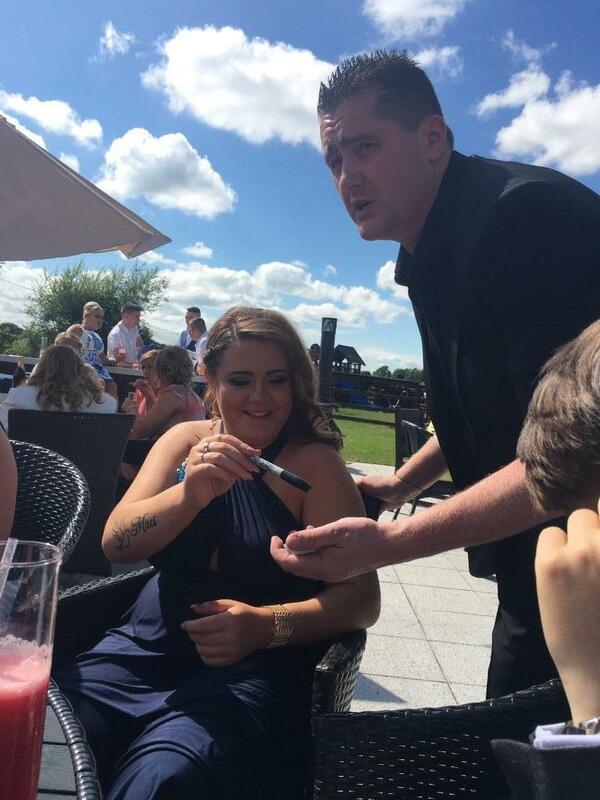 Thsnks so much for booking me to perform at your wedding in Westgrove in Clane. It's a really lovely hotel for a wedding. 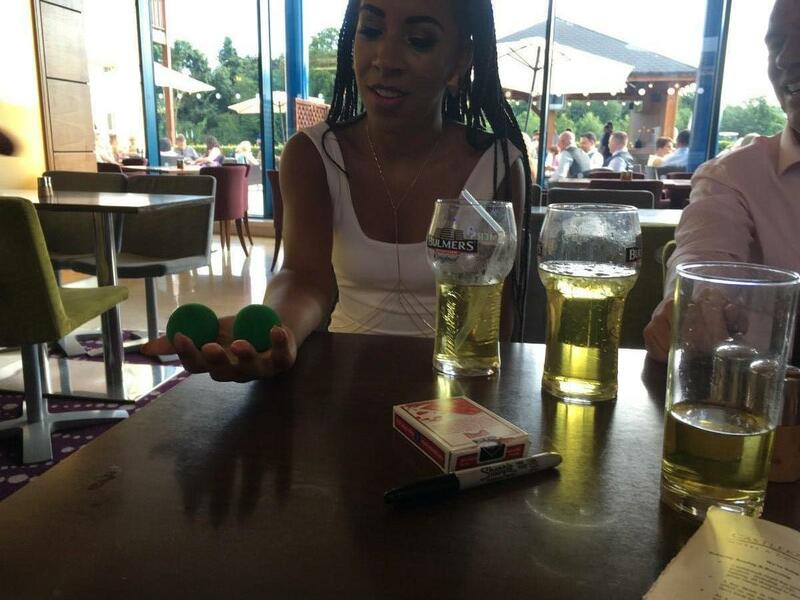 Your guests were so nice to me and their reactions to my tricks were very funny. Anyway thanks again and best of luck to you and your new husband for the future. Best magical wishes Carl. 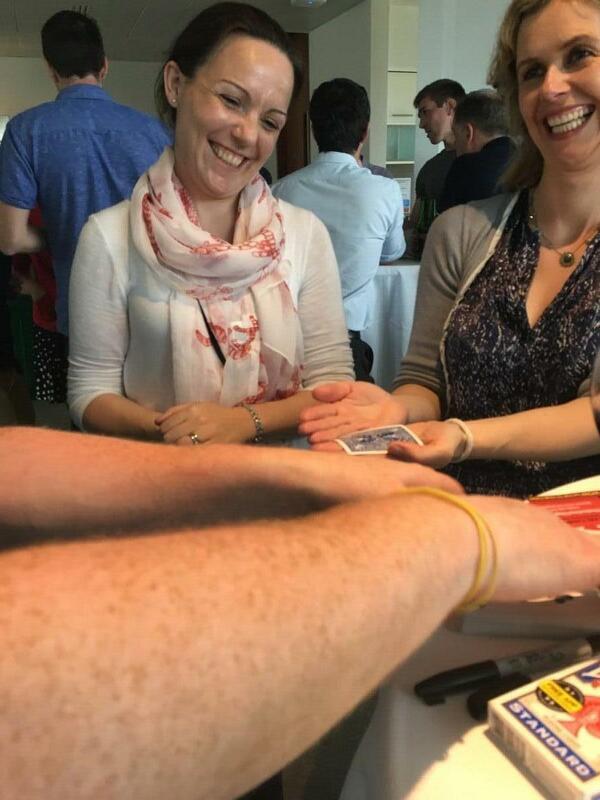 We decided to use a magician at the reception instead of background music that doesn't get noticed. Carl was an excellent choice and worked with us to suit what we were looking for. 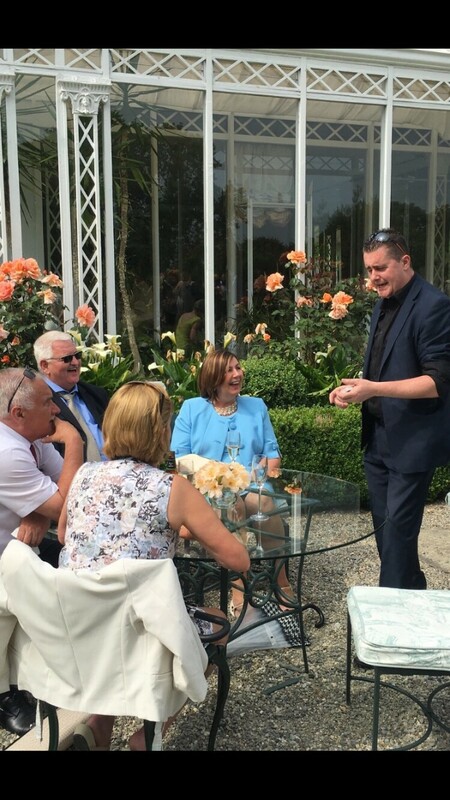 Our guests loved him and 2 months later they are still talking about him and how unusual it was to have a magician/mentalist. It was a great way to get people that didn't know each other to mix better and was a good talking point and ice breaker. We would highly recommend Carl!! To all brides and grooms who want a really special extra dimension to your day, look no further than Carl.. If you want Unbelievable magic under your very noses at dinner, with mixed reaction of stunned quiet amazement — how did he do that? 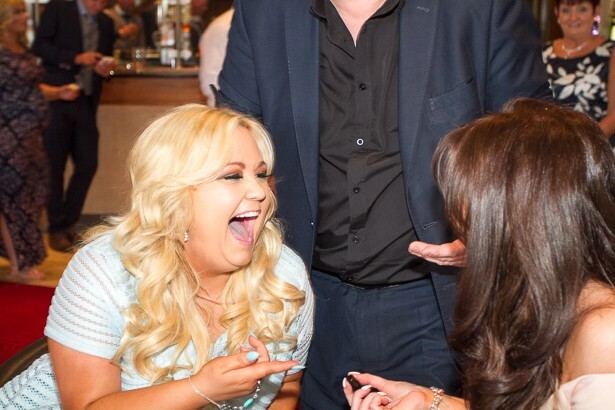 to shrieks of glee, howls of laughter and the unexpected joy of disbelief Carl's skill and humour is what you need.. Professional deception at its very best — a real must have on the most special day of your lives. My husband and I heard of Carl by word of mouth and we kept this fabulous secret from our guests. What a good move! We are still getting amazing feedback almost 2 months after our wedding reception, especially from overseas guests, who had never experienced such fun with dessert!! Please do yourselves a favour and dial Carl’s digits! Hey Sinead. Thank you so much for booking me to entertain your guests. It's lovely to hear all the guests had wonderful time watching me perform. Hopefully i will meet you guys again sometime in the future. Magical best wishes Carl. Carl was very professional and his magic skills were excellent. I would not hesitate to recommend him for your wedding. Our guests thoroughly enjoyed his work. If you want a magician book Carl. Hi Cherith. Thanks for a nice testimonial. I had a brilliant time performing at the pre reception at your wedding. I'm sure you could hear all the laughter as i was performing. Thanks a million for booking me and best of luck for the future. We booked Carl after seeing him at wedding fair. Great value and the guests absolutely loved him. People still talk about Carl when we meet them and would highly recommend. Excellent way to keep guests entertained while they are hanging around waiting for bride and groom to come back from photos and the dinner call. Even got the children involved which was great???????? Hi Ross and Aine. 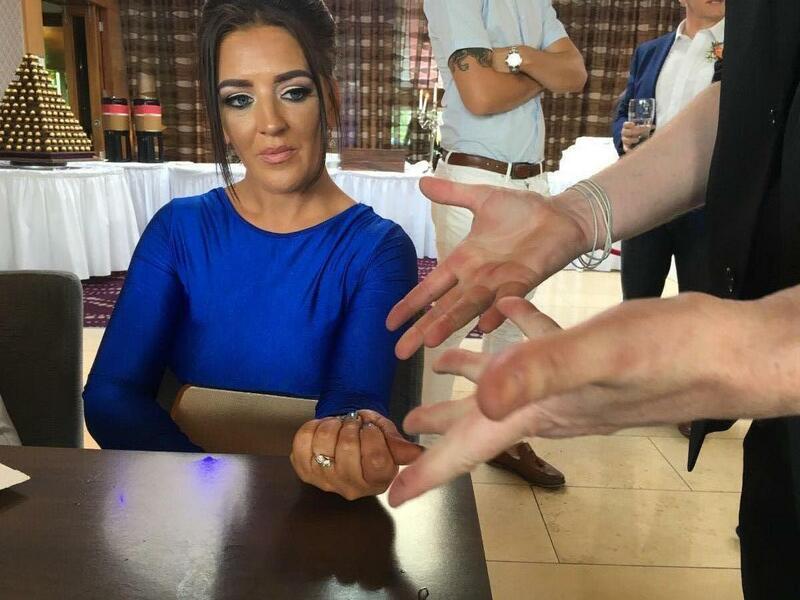 It was brilliant that my close up magic went down so well at your wedding. I think some of your guests taught i really could make the children vanish. Lol. Only joking. Best of luck for the future and thanks for booking me to perform on your big day. Carl. Would highly recommend Karl .His amazing .My guests are still talking about him today . 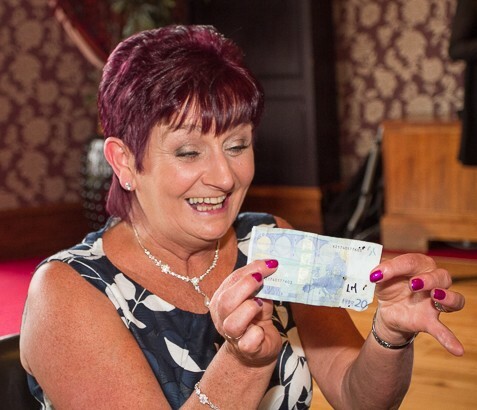 Great way to entertain your guests while off getting photos taken, money well spent!! We had our wedding in august last year. We booked Carl to perform. He did a fantastic job. All our guests loved Carl. Hi Colin. Thanks for your lovely review. 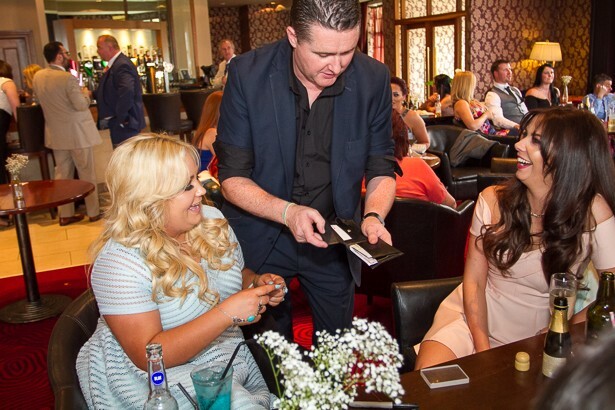 Really appreciate you guys booking me for your wedding and I'm delighted all your guests enjoyed my close up magic during your meal. Best wishes Carl. 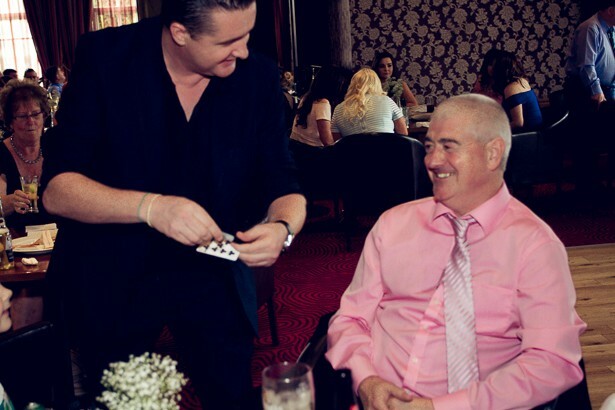 We first met Carl at the RDS wedding fair and were immediately impressed with his professional yet relaxed manner. We booked him for our wedding on Saturday 2nd May 2015, and couldn't have been happier with how it went. 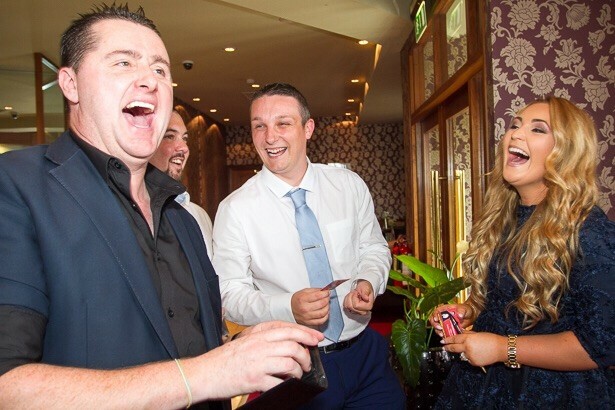 His tricks and humour kept our guests highly entertained for the couple of hours we were getting photographs done, and when we came back to the room the magician was all everyone was talking about. Both young and old were equally amused and impressed, and it proved a real talking point. We would definitely recommend Carl for anyone getting married who is looking for that something to keep the crowd entertained. Carl was a brilliant addition to our wedding celebrations. He appealed to all of our from the kids to our friends&parents&grand parents! Everyone enjoyed his performance with plenty of laughs&unexpected shocks! 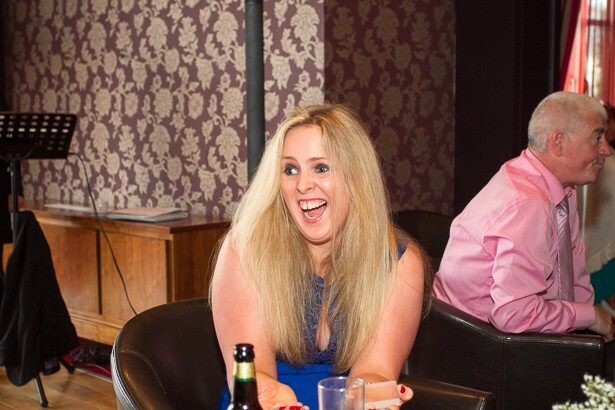 Proved for great photo opportunities for our photographer to capture our guests laughing&enjoying themselves! Thank you so much Carl. 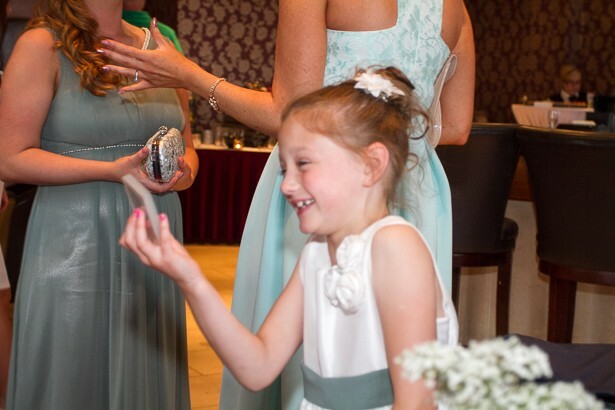 We had Carl at our drinks reception, we had all age groups at our wedding from very old to very young and Carl appealed to them all! We had a bit of a hiccup the morning of my wedding before the church which delayed us so the whole day ran a little behind and even though Carl was booked to be at the hotel at a certain time an only had to stay for the time he was booked he stayed longer and when came into the reception room and went around tables to guests he didn't get a chance to see at the drinks reception, this was beyond what he was obligated to do! I have recommended him to many friends and family since my wedding and would urge anyone who is looking for a really good way of entertaining their guests to have a look at Carl! Review by Marian & Dean. Thank you so much Carl for an absolutely fabulous job of entertaining my guests at my 40th birthday party. The way you worked the tables ensuring that everyone got to see the magic was not only professional but meant that everyone got to share in the amazement of magic itself. I have to say that is was the best thing about the party, everyone was talking about it for hours afterwards and I am still getting texts today telling me how amazing you were. Many thanks for making it a real party to remember, my friends will never top this one! seriously though I was thrilled, many many thanks. We booked carl for our wedding in sep 2009, initially we were hasty about booking as we thought it may be an unnecessary cost, how wrong we were! carl entertained our guests superbly from the time they arrived at the hotel until the start of our meal, all our guests commented on how it was a great idea to book carl as he filled those normally dull hours at a wedding with laughter and amazement, we would highly recommend carl for your big day too. Hi Carl, Just a quick note to thank you for your show at our Christmas party last week. I can safely say it has been the best entertainment we have had at any of our functions and proof of this is the fact that many in the office are still talking about your stunning tricks. You certainly filled our requirement of looking for something different by way of entertainment on the night and you did not disappoint. You really helped to get the crowd relaxed and the constant laughter and startled reactions of both myself and my colleagues is a testament to this. I would have no hesitation in recommending you for future events both in and out of work and I have already passed on your web address to a few others. Great night had by all and hopefully not the last we'll see of you, Regards, Stephen Fee, Business Change Unit, Allied Irish Banks, p.l.c, Bankcentre, Ballsbridge, Dublin 4 . On Behalf of myself and everybody present, I would like to say a huge THANK YOU to Carl for his fantastic performance and the amazing energy he added to our event. Carl certainly has that “Wow” factor and some of his tricks were truly unbelievable. He created an amazing atmosphere at the event and is obviously very passionate and professional about his performances. At large events it is so important to include everybody and make sure everybody feels comfortable and at home. Carl succeeded at turning the whole attendance into one group with his confidence and charisma. Everybody loved his performance on the night – our guests are still talking about him – it’s made our event so much more memorable for everyone. Based on this performance, I would recommend Carl to anyone. Just wanted to let you know how amazing you made our wedding on 9th October 2010! You were professional, talented, entertaining and thrilling – and you looked the absolute part! 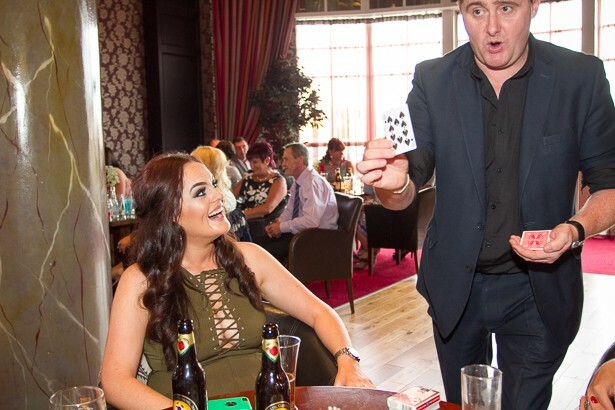 Our guests are still talking about you and your incredible magic tricks! You really added that something special to our wedding day! Thank you so much! We will definitely be recommending you to friends and family! Best of luck in your future work! Carl performed at a fundraiser we had last weekend. He has a natural ability to entertain and amaze the audience. He added a huge amount to our event and the feedback we received from everyone was very positive. I would highly recommend Carl to anyone who wants to add something special to an occasion.